Cook bacon until crispy. 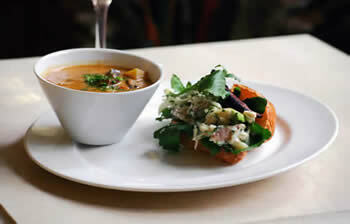 Mix together crab meat with sliced apple, Tabasco, chopped onion, lime juice, parsley and dill. Add half of the mayonnaise to the mixture and incorporate well. Cut the croissants in half, spread mayo over the croissants. Place a generous amount of the crab mixture onto one half of each croissant, dividing evenly over eight croissants. Top with avocado and lettuce leaf, fold the top portion of the bread over and enjoy.